This past week we travelled by plane from Florida to Chicago for my uncle’s funeral, which is why I didn’t post last Monday. While the flight there was uneventful, the last flight back after our week of funeral and family experiences created an indelible memory. On that flight my family of five was scattered in various middle seats, except for Princess and I, who were able to sit together thanks to a kind desk agent and some creative re-seating. As we boarded the flight I arrived at our seats to find a tall, older gentleman folded into the window seat. He could not have been comfortable. I jokingly said, “Well, you’re the winner today!” as I dumped backpacks down and got the booster seat in place for Princess. “I think I am,” he replied, “to sit next to this beautiful little girl!” I practically sighed in relief to that unexpected response – it was music to this tired, sad, stressed-out mom’s ears. He excused himself for a moment to get his portfolio out from his carry-on in the overhead compartment – no easy task – and then settled back in. As the plane took off and rose into the air, Princess and I watched as he flipped past pages of numbers and notes in his yellow legal pad and tore out a fresh piece of paper. Then slowly and carefully, he creased and ripped the page across until he had a perfect square. 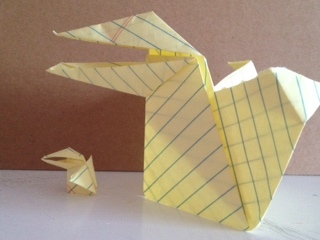 He continued folding and creasing until he finished his project, and presented Princess with an origami crane. She was thrilled, and loved that she could make the beak open and close by moving the wings. While she was playing with it he made a tiny version with the leftover paper. Princess then made her big crane eat the little crane and throw it back up, to which he chuckled and said that he had never seen anyone do that before! The cranes definitely kept Princess occupied until she finally dropped off to sleep, leaning over onto his shoulder for her nap! He gave me a wave to say it was all right when I was going to move her, and they both settled in for an hour while I read. So peaceful. On the descent he continued to make two more cranes for Little Miss Sunshine, who was across the aisle from me, and talked to Princess about how she was going to decorate her crane at home, which kept her mind somewhat off her popping ears. I was so touched by his thoughtful nature and thanked him for the cranes, explaining briefly the reason for our trip. He offered some words of comfort regarding holding on to memories, and I thought about whether I would be that attentive and peaceful if someone else’s three-year-old was sitting next to me. Honestly? I don’t think so. When I’m travelling without my kids I just like to read and ride in relative silence – I wouldn’t be the best of company to a random toddler. But I’m glad he did not take that same attitude because he made the last leg of our journey both peaceful and memorable. Lord, origami cranes are often made as a gesture of healing and hope. Please help me make that gesture with a moment of my time, a kind word or a hopeful and helpful act when needed. Try your hand at paper crafting, or let the kids give it a whirl. Here’s a great site for learning all sorts of clever creations. I’m glad you stopped by – thank you! Thanks Heather! While reading this, I could sense the Peace that exuded from this gentleman, and the very reminder to live a life of patience is not the option for the believer, but is actually a fruit of His Divine Nature at work in and springing from our lives. I have just been confessing to my Sunday evening discipleship group that patience is one area that God is putting his finger on in my life and saying, “grow!” And then empowering me to make it happen! I appreciate so much your reminder on this! Thank you so much for your response to this, and for the reminder that patience is one of the fruits of the Spirit!